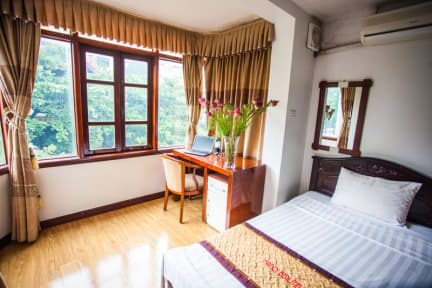 Hanoi Old Town Hotel i Hanoi, Vietnam: Reservér nu! A great hostel with a very friendly and helpfull staff. I'd recommend it to anyone! A great hotel! As Lily, their tourmanager, said to us, the hotel is very basis, but they try to make up for it with great service, and that they succed in! My family and I have stayed in many hotels all over the world, but at this hotel we have experienced some of the nicest staff. Really recommend. 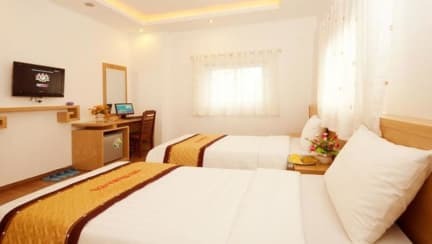 Very good and clean Hotel located in the heart of the Old Town of Hanoi. I would highly recommend this Hotel. Also, the staff is extemely kind and helpfull! Room was big and with a nice view of the street, but mouldy smell. Free breakfast was alright. Staff wasn't very welcoming and in general for no use. We complained about the smell, but it took two days for them to send someone to look at it. I asked them to send a postcard for me, but was pointed to the postoffice. When leaving for Halong we asked for a shuttle bus to get us there, and they arranged it, but the shuttle never arrived in Halong City, so we had to get a taxi for another 20 minute.